This High Pollised Silver Stainless Steel heart charm bracelet is sure to put a smile on her face, whatever the occasion. A perfect gift for all ages. The heart charm measures .75 inch, and the bracelet is adjustable in 5 to 8 inch lengths. This silver heart tag bracelet has a polished finish, and can be engraved. 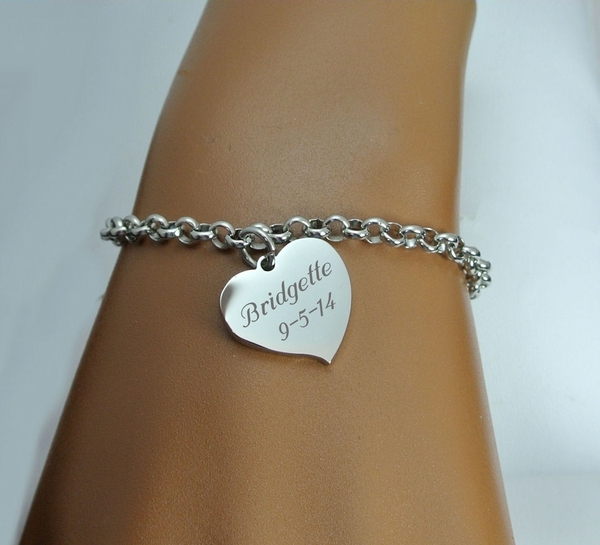 We carry most of our engravable bracelets in higher quantities and offer discounts for corporate gifts, weddings, reunions and more. Beautiful gift for a best friend, sweetheart, mother or to anyone you love. Great personalized gift for anyone a touching and lasting expression of affection, friendship, celebration, congratulation or thanks. engraved necklace pendants and i.d. bracelets.